Lazarides Gallery present's new work from Parisian photographer JR. Huge vistas around the world adorned with JR’s challenging images are now his trademark, and this double gallery show will inspire new large-scale street works. 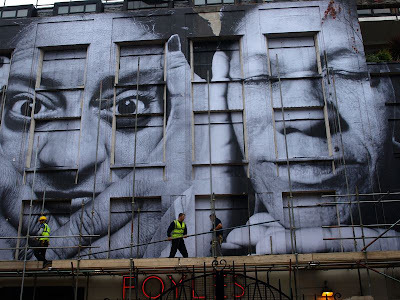 The shows at Lazarides Greek Street and Charing Cross will be linked by a street work inspired by JR’s time spent in Rio de Janeiro, where he worked on his project, 28 Millimetres: WOMEN. In the favelas he met women for whom crime, violent loss of loved ones and arbitrary repression are part of everyday life. His response was to paste images of their eyes onto the buildings of Providencia, creating an arresting image that was seen around the world, and fuelled JR’s ongoing campaign to draw attention to things that go unnoticed. In Soho JR will create the first audioguide to be taken out of the museum and into the street, readapting the concept for a larger public. Under each image will be a freephone number, which the public can call to hear each woman’s story. Image taken by Unusualimage, see more on his flickr here.